Hallsville, built in 1891, is the oldest active school in the city. 2005	James Madison’s Montpelier, Montpilier Station, Va.
Montpelier, the home of James Madison, was built around 1764. In 1983, Marion du Pont Scott bequeathed the property to the National Trust for Historic Preservation. In December 2003, the Montpelier Foundation launched a complete restoration of the mansion. The decision to restore was based primarily on the importance of James Madison to the formation of the U.S. government. 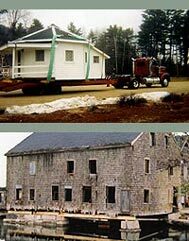 In 2005 3G Construction helped shore and stabilize portions of the Madison’s home. Listed on National Registry of Historic Places, built in 1834. 3G Construction restored a three story wall of brick, lime mortar and timber construction. Also realigned a section of a brick wall, restoring the brick and lime mortar. Exterior millwork and interior finish work was done as well as reinforcing the roof system. The tide mill was built in 1806. It is listed on National Registry of Historic Places. The mill itself is the only remaining tide mill in the United States that still retains both a gristmill and a sawmill. It was partly owned by the Adams family, and was used variously for shipbuilding, granite transportation and lumber production. The Bunker Hill Monument was built with granite that came from the mill. The mill's foundation remains viable, due in large part to work done in 2001. 3G Construction worked on the stabilization of 28’ x 51’, 2 ½ story heavy post and beam structure over the town river which involved jacking and replacing pilings and reparing a granite foundation wall. Work was also done to repair and replace timbers with conventional and new hand hewn timbers. The Exeter Town Hall was built in 1855. The main hall is still used for meetings and voting. The Statue of Justice that is on top of the cupola was put there in 1855 when the building was built. 3G Construction did restoration work to the cupola including masonry and millwork restoration, fabrication of new mahogany round top w	indows, plaster moldings and gilding.